Asphalt 8: Airborne is coming and Gameloft is already teasing the new racer with an impressive video showing a new physics engine, mind-boggling graphics and a lot of action with cars jumping off ramps and going airborne doing stunts for a while. 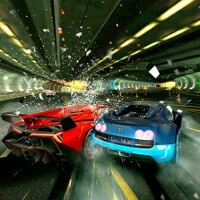 Asphalt 8 comes with eight maps and seven of them are brand new. You’ll get to experience racing in the Nevada desert, the busy streets of London, Tokyo and drive through frozen tracks in Iceland. The last, eighth map is a renewed map of Monaco. All of that racing comes with new weather effects for more immersive experience. Best of all, though, the new Asphalt 8 will only cost $0.99 and is coming up this summer. Now, that sounds like a killer combination, doesn’t it? Damn...graphics on my PC was never this good (yet). Not true, the iPhone 5, HTC One, etc. can also take it on. Id even give the edge to the iPhone 5 because of better optimizations on IOS. All the latest flagships but certainly not the lumias with their outdated gpu.. This must be have a huge drain on the battery!!! !